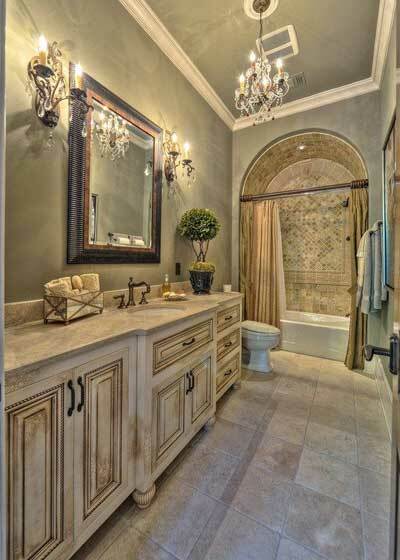 Every people would love to have a bathroom with a beautiful design. 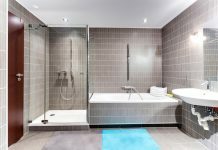 Surely, no one would deny it as having a gorgeous bathroom means that a comfortable place for us to refresh our body from our routine activities. 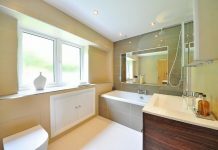 Unfortunately, most people are confused to decide which design is suitable and beautiful enough for their bathroom. Now, no need to confuse anymore as we have prepared some beautiful bathroom designs that would be suitable for you. The Mediterranean bathroom design gets the influence from the Spain, Italy, and Greece. 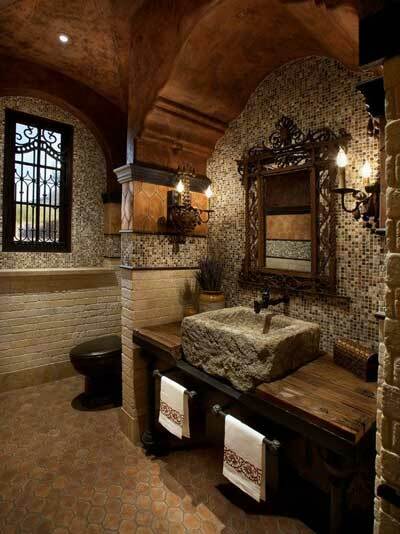 If we are going to one of those countries for a vacation, we will easily find this beautiful bathroom design in a lot of houses or hotels there. The design is really outstanding where it looks casual but very comfortable to use. The tile is one of the main components of this bathroom style. This component cannot be separated from this design as it has become the identity of the Mediterranean style. Just take a look how beautiful the hexagon tile is but, it is not the only tile design that we can find in this Mediterranean bathroom. The other components that are identical to this design are the stone vessel with a mounted faucet, wall sconce, chandelier, and the arched doorway or shower stalls which has a curve form. 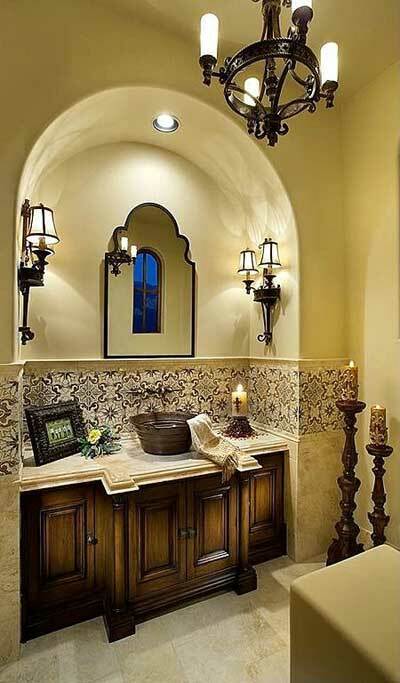 The Mediterranean bathroom style design often uses those components to show its identity. 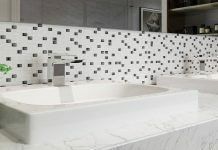 So, it is not only the tile design which becomes the important component. As we can see that most of those main components that we have mentioned above are also used in the third picture above. 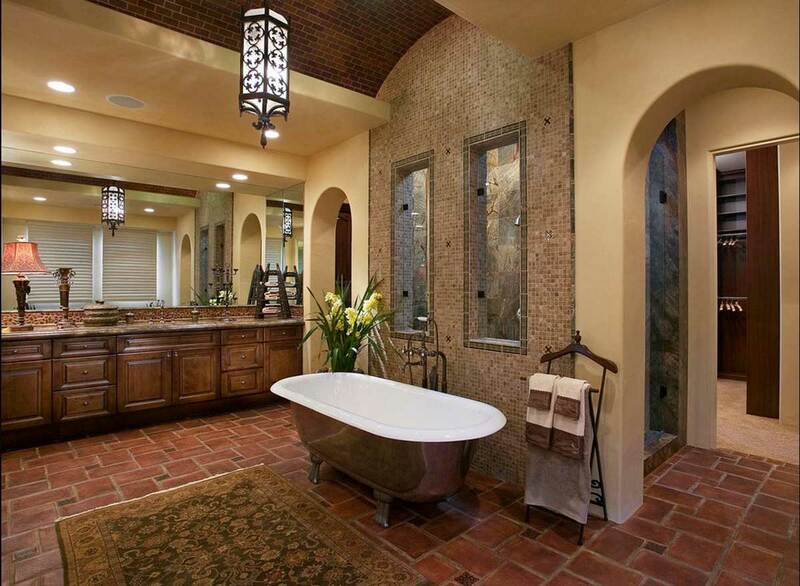 The Mediterranean style is a really good and suitable choice for a bathroom with a gorgeous look. And the most important is that it does not only look gorgeous but also elegant. Now, for the furniture itself, this bathroom design uses a lot of furniture which made from the wooden material such as the cabinet, bench or chair, and etc. Those kinds of furniture give a strong impression to the design itself especially with the use of color which matches perfectly with the design. The Mediterranean bathroom design often uses the yellow, brown, or rust like the example picture above which can add a lively element to this design. Those colors have already become a trademark of Mediterranean bathroom. 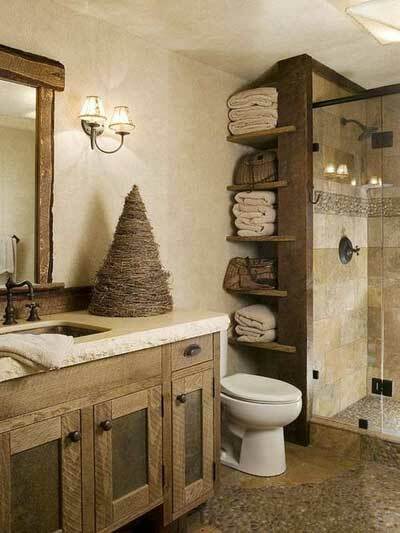 Overall, if you want to have a beautiful bathroom design, this one should be considered by you. 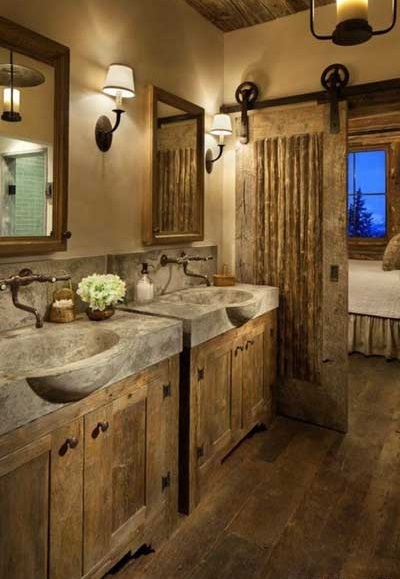 The Rustic bathroom design focus on giving a natural impression of the bathroom by using the furniture or decorations which comes from the wooden, rock, metal, and the other natural materials. 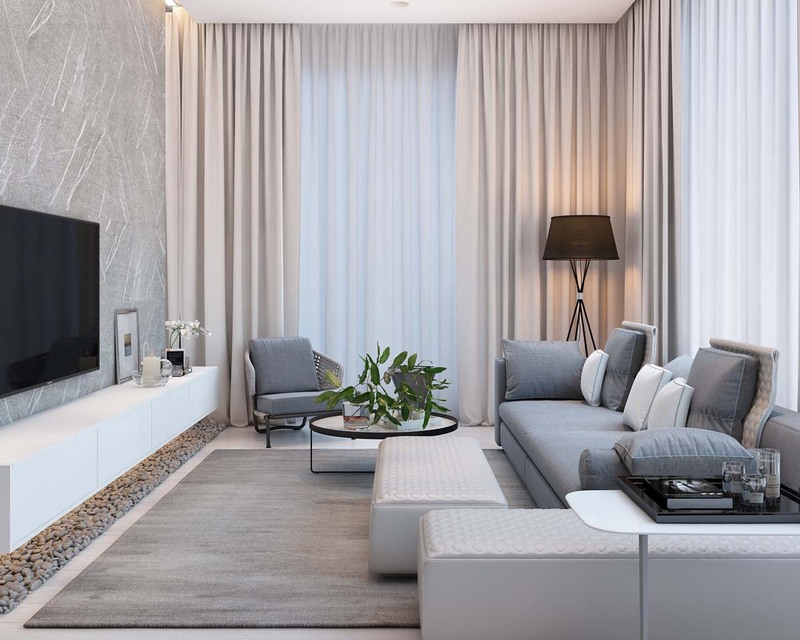 The term natural in this design refers to the use of furniture, decorations, and etc that is not getting a finishing touch like painting and polishing. 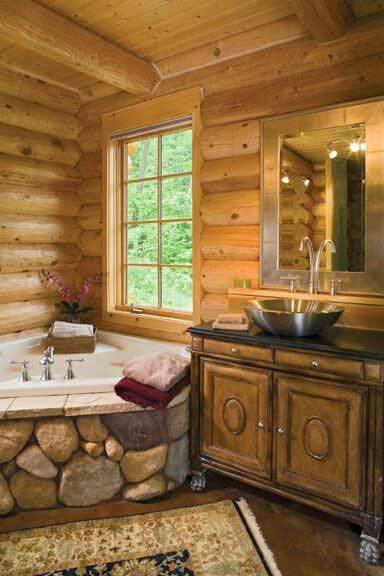 Just check out the wood and natural stone material that is used in the bathroom above. It looks more natural and makes us feel close to nature. As we can see, the wooden material almost used on almost every single corner of the room starting from the floor, ceiling, window and mirror frame, and cabinet where the counter table and vessel are using the material which made of natural stone. 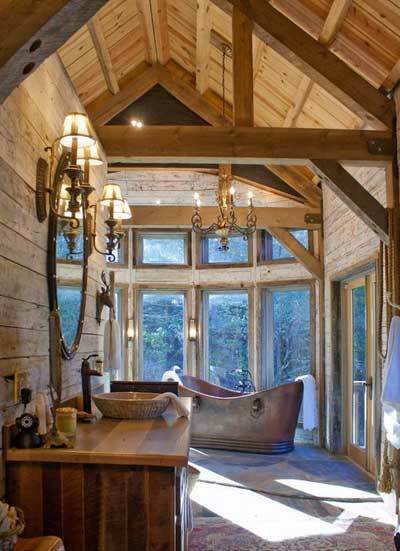 A bathroom design with a rustic style like this often found in the houses which located in the mountain area. So, it is rarely found in the houses which located in an urban area. But, if you are looking for a design which looks different, this one should be suitable for you. Do not you bored with the bathroom design which uses cement wall and ceramic tile? Of course, this one would be a good choice as it does not only look simple but also elegant. And the most interesting thing is that this one can be applied to every size bathroom. So, it does not matter if your bathroom is big or small because it is suitable for all size. You can take an example from the picture above. 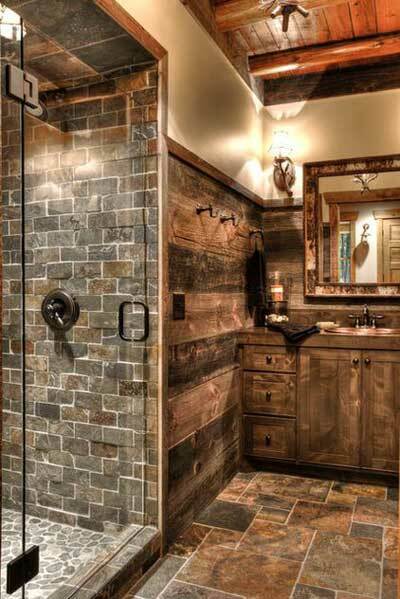 Overall, we can say that this Rustic bathroom style will be a very good choice if you like something more natural and related to nature. And we are very sure that every people are willing to spend a lot of time taking a bath there. So, which is bathroom design that you like the most from the two beautiful bathroom designs above? The one with Mediterranean design or Rustic design? No need to hurry in choosing it because both are really beautiful. And if you ask for our opinion, we can suggest you choose the Mediterranean one because it has an artistic value. Then, just take your time and choose it wisely. Next article7 Beautiful Living Room Designs || The Outstanding Designs Presented by Roohome!